Large white beans are popular in Asturia, Spain, a northern region with an extensive coastline along the Bay of Biscay. 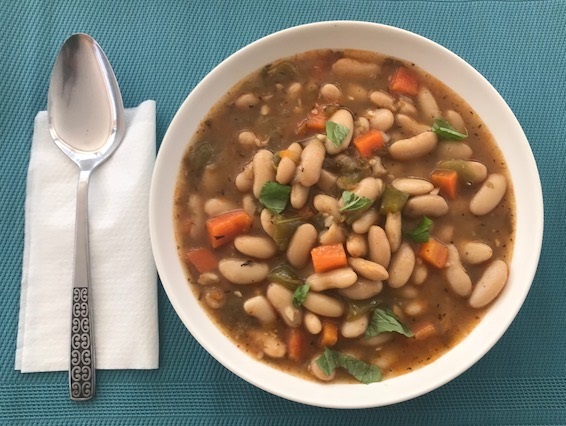 They use local faba white beans, (the best beans are hand selected) but if you can’t find them easily, you can opt for large white kidney beans, lima beans, or cannellini beans. The region is known for its cold, wet climate, making a hearty soup heart-warming. It has been beautiful sailing in and out of multiple scenic ports along this amazingly rugged coastline. You could use pre-cooked canned or jarred beans, but I find them always a bit overcooked, lacking the proper texture and flavor. Ideally, you would soak them overnight, rinse them in the morning, and cook them the following day, details below. Traditionally, the people of this region use bacon or pork sausage (chorizo) in their soup, but my personal preference is to skip it. If you do use pork products, be sure to buy organic and pasture-raised, with about 1 pound of spicy sausage and 4 strips of sliced bacon for this recipe. Express Version: You can make the express version with pre-cooked beans start to finish in 30 minutes. In a large bowl, add enough water until beans have an extra 2 inches (5 cm) of water covering them, add more water to keep covered as needed. Soak overnight (preferably 10-12 hours), drain in the morning, and refrigerate until ready to cook. Heat a large pot over medium heat, add oil, then onions, salt, and black pepper, and sauté stirring occasionally for 2-3 minutes, until onions soften, then add carrots, green pepper, bay leaves, vinegar, paprika and thyme, and heat another 3-4 minutes with an occasional stir. Add garlic and parsley and heat another 1-2 minutes. Would sprouting the beans help? I know beans have many anti-nutrients that are helped by sprouting. Also helps with digestion. Thanks for sharing your recipe. Sounds terrific!